Erlanger ICU surgeon Dr. Philip Smith, Trauma Program Manager Angela Basham-Saif and Critical Care Nurse Clinician Jana Jackson, from left, stand in front of the trauma ward at Erlanger on Tuesday, July 21, 2015, where they attempted to save U. S. Navy Petty Officer 2nd Class Randall Smith after he was shot by Mohammad Youssuf Abdulazeez last Thursday. By the time the ambulances were barreling down Amnicola Highway, flanked by police cars with flashing blue lights, the news already had started to ripple across Erlanger hospital. Erlanger ICU surgeon Dr. Philip Smith, Trauma Program Manager Angela Basham-Saif and Critical Care Nurse Clinician Jana Jackson, from left, stand in front of the trauma ward at Erlanger on Tuesday where they attempted to save U.S. Navy Petty Officer 2nd Class Randall Smith after he was shot by Mohammad Youssef Abdulazeez last Thursday. "Heads up," trauma program manager Angela Basham-Saif texted the hospital's trauma surgeons and chiefs. "There is a report of an active shooter on the Army reserve base on Amnicola." At least one patient was likely already on his way, she added. Inside the ambulances were U.S. Naval Petty Officer 2nd Class Randall Smith — clinging to life — and Chattanooga Police Officer Dennis Pedigo. They were being sped from the U.S. Naval and Marine Reserve Center, where four Marines lay dead at the hand of Mohammad Youssef Abdulzeez. Another ambulance rushed from Lee Highway, carrying a Marine recruiter who had been shot in the leg. The wailing ambulances were bound for Chattanooga's Level 1 trauma center, which handles the region's most serious injuries. 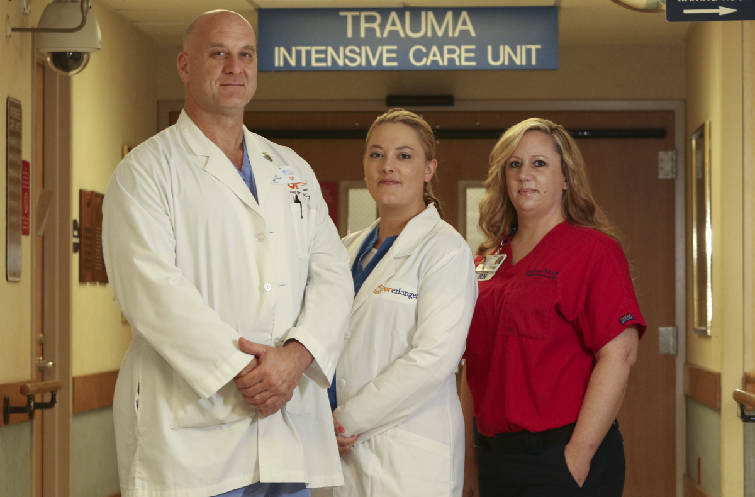 Victims of shootings, car wrecks, and more recently, tornadoes have all ended up under the care of one of Erlanger's specialized trauma teams, which have trained for countless injury scenarios. But Thursday was unlike any other day. Before the ambulances even arrived, EMS workers had begun to relay information about the men and their wounds back to Erlanger. At 11:20 a.m. — less than 10 minutes after officials say the shooting ended — the first ambulance pulled up outside the emergency room. The hospital quickly went into lockdown, readying for an influx of injuries. The special pagers clipped to every member of Erlanger's trauma team buzzed. Three traumas were being activated: Level 3, Level 2, and the most intensive of all, Level 1. A trauma activation, whether it's because of a shooting, a car wreck or a tornado, has to work like clockwork. Every person on the 10-or-more-person-team has to play a highly specialized role. On Thursday, doctors, nurses and members of the trauma resuscitation team, nicknamed "red-shirts," congregated in the bay. They stood in their assigned spots, pulling on their gowns and strapping on their masks. And then they waited. As soon as the patients were rushed into the emergency room, the call came: "All quiet!" The bay fell silent as the lead surgeon evaluated the patient, then started giving orders. Blood. IVs. Medications. The team on Smith's case — led by trauma surgeon Dr. Philip Smith, who is not related to the sailor — did not release any specific information about the medical cases of the fallen Navy member or of Pedigo and the Marine recruiter, who has remained unidentified. In many cases, the injuries the men suffered were nothing the trauma team had not handled before. 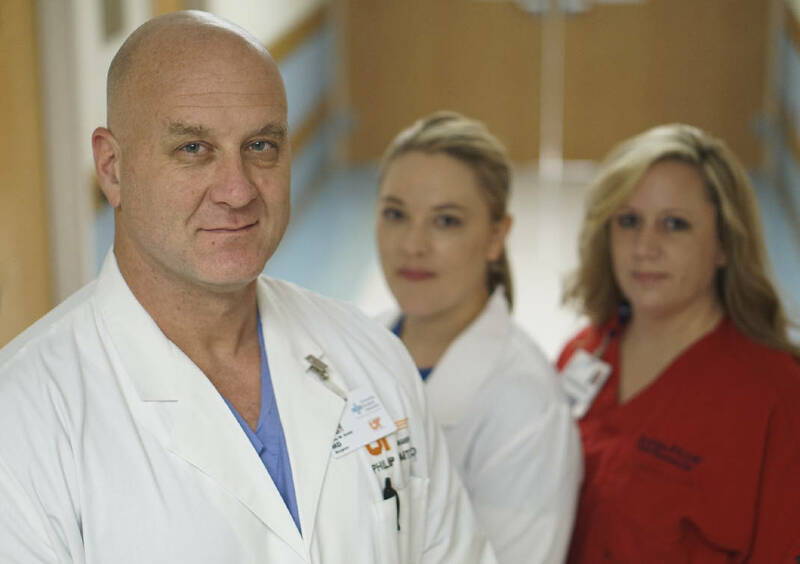 Treating multiple gunshot wounds in a single night is not unheard of in Erlanger's ER, Dr. Philip Smith said. But Petty Officer Randall Smith's case, and the events around it, came with a gravity unlike any Dr. Philip Smith had experienced in his career. "It is the kind of thing you hope you never see," he said. Dr. Philip Smith estimates that hundreds of Erlanger staffers — everyone from lab techs to pharmacists to anesthesiologists — helped care for the shooting cases, either directly or behind the scenes. Unaware of the headlines streaming across national TV, the "red shirts" stayed right by Petty Officer Randall Smith's side, working to keep his body functioning however they could. The trauma team, said chief nursing officer Jan Keys, is an "elite team." "They have a job to do. They work very, very closely together. I've never seen such devotion and commitment to really make it work." The Marine recruiter, who was shot in the leg, was released later that day. Meanwhile, other physicians set to work treating Pedigo's leg wound. Jana Jackson, a critical care nurse clinician and a red shirt, said she could not let the weight of the unfolding national tragedy enter her mind. "At the time, you push everything out of your mind and you just do your job," Jackson said. But not everything was clinical. At one point, Jackson said, nurses gathered around the sailor's bed. His favorite song was Neil Diamond's "Sweet Caroline," his wife, Angie, told them. A nurse cued the song up on her phone, while the others quickly Googled the lyrics on theirs and gathered around the foot of the bed. The sound of the familiar bass line and horns filled the room. They all sang. Navy officials said Petty Officer Randall Smith died at 2:47 a.m. Saturday morning, after fighting for nearly two days. The moment was quiet, nurses said. "I am amazed he fought as long as he did," Dr. Philip Smith said. On Monday, Heritage Funeral Home in Fort Oglethorpe confirmed Petty Officer Randall Smith will be buried at the Chattanooga National Cemetery. "Anytime we lose a trauma patient, it is always too soon," Basham-Saif said. "But the real grief is the family's. That is beyond our comprehension."